Just like the treehouses kids used to get away from it all — they were at least separate from the house — a Hardin County couple is providing a similar experience for adults and families. 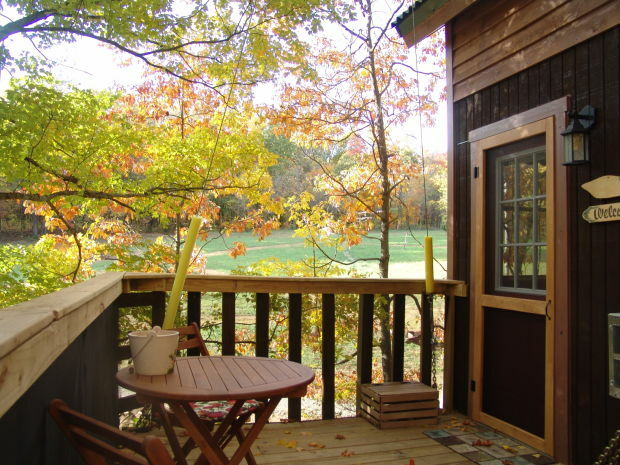 Timber Ridge Outpost & Cabins is Illinois’ only treehouse and log cabin resort and the closest recreational lodging available to Garden of the Gods, co-owner Elizabeth Canfarelli said. She and her husband, Marty, opened Timber Ridge in 2012, which today offers lodging in a choice of two treehouses and two log cabins on 120 acres next to the Shawnee National Forest. These are not your treehouses of childhood lore. While the aura of camping and the outdoors remains, Timber Ridge tree houses also feature modern amenities such as heating and air-conditioning, a kitchen, bedding and showers. The log cabins offer many of the same features. One treehouse is perched 24 feet in the air in a 200-year-old White Oak, with large branches extending into the cabin and through the cabin’s deck. The Canfarellis are not done. They are now in the process of adding two log cabins originally built in the 1850s. The cabins are now being reassembled and are expected to open this year, one as an outpost for guests, and the other as lodging. Another unique feature of the year-round business is that pets and children are welcome, Elizabeth Canfarelli said. As much as the Canfarellis are relying on the novelty of luxury lodging in a tree, they are also counting on the surroundings to attract customers. To supplement the lodging, the couple is also developing programs such as archery lessons, kayak rentals, horse and carriage rides, and guided tours. They are also planning other amenities, such as a rope bridge and more. Now in its second full year, drawing customers from 12 different countries and exceeding projections, Elizabeth suggests making reservations three months in advance for the tree houses. Having retired to the region — he built high-rises in Chicago as a labor foreman and she was a senior project manager — the couple is enjoying their new line of work. “I don’t feel like I have a job,” Elizabeth said.